It’s convenient that the Lions practice facility in Allen Park is so close to the Detroit airport, especially in the spring. Each NFL team is allowed to bring in 30 draft-eligible players for a pre-draft visit. This week the Lions brought in offensive tackle Eric Fisher (Rochester’s Stoney Creek High School, Central Michigan), cornerback David Amerson (North Carolina State) and versatile running back Onterio McCalebb (Auburn). 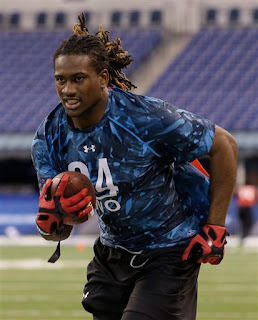 A few weeks ago Justin Hunter and Cordarrelle Patterson (in photo), both wide receivers from Tennessee, visited. These visits are key to the draft process and ocasionally come into play down the road. At the NFL Combine in late February, teams have quick meetings with several players. They may take a potential first-round pick out to dinner or meet privately with a few during the Combine week. They can not get to everyone. If a guy doesn’t get a pre-draft visit he could still be on the Lions’ radar. Some guys the Lions want to get to know a little better. Some players they feel they know after the Combine. 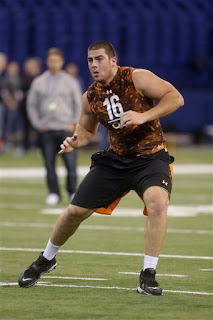 Last year’s first-round pick Riley Reiff was not invited for a visit, but met with the team at the Combine. The pre-draft visit features a physical exam. The players can also be interviewed and tested. But they cannot be timed and tested on the field. Even if they don’t get to draft a guy who impressed them at his pre-draft visit, he could stay on the Lions’ radar. Wide receiver Kris Durham is one of those guys. He was brought into Detroit for a pre-draft visit prior to the 2011 draft when he was selected by Seattle in the fourth round. He was cut after Seahawks training camp in 2012 and immediately signed to the Lions’ practice squad. He was still on the Lions’ radar. Durham was activated at the end of last season and is likely to contend for one of the wide receiver positions in this summer’s training camp. It’s all a process and pre-draft visits can be key. Tackle Eric Fisher and cornerback David Amerson visited the Detroit Lions today, according to the team web site. Fisher, who played at Rochester’s Stoney Creek High School and Central Michigan, is expected to be a top five pick in the NFL draft. It’s possible that he will not be available when the Lions draft at No. 5. The Lions have openings at left tackle and right tackle with the retirement of Jeff Backus and because Gosder Cherilus left in free agency. Riley Reiff, who was drafted in first round last year, is expected to start at one of the tackle positions. Fisher’s stock has climbed since the Combine. Mel Kiper has Fisher as the second overall pick going to Jacksonville. He also has the Lions drafting Ansah. Amerson, who played at North Carolina State, is likely a second-day guy. CBSsports.com has Amerson (6-foot-1, 205 pounds) ranked as the sixth best cornerback in the draft and projects that he’ll be drafted in second round. Amerson was an All-American in 2011 with 13 interceptions but faded in 2012. 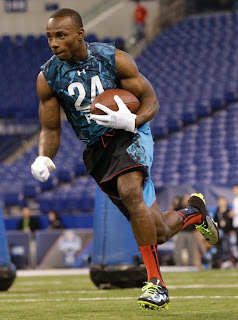 He ran an official 4.44 40-yard dash at the Combine. In comparison, Dee Milliner, considered the top cornerback in the draft ran a 4.37 at the Combine. The Lions look for speed in their cornerbacks where there is an opening for a starter beside Chris Houston. Detroit drafted three cornerbacks a year ago — Bill Bentley, Chris Greenwood and Jonte Green — and they are expected to contribute this season. The Lions have eight picks in the draft which will run April 25-27. Amari Spievey’s arrest on three charges after a fight with his girlfriend over child support this week is the first legal trouble this off-season for a Detroit Lions player. It will be coach Jim Schwartz’s first test regarding off-field behavior since he cut cornerback Aaron Berry last July after his second arrest which was the team’s seventh off-season arrest. Berry’s first was a drunk driving charge, his second was three charges of simple assault. Spievey was charged with third-degree assault, risk of injury to a child and disorderly conduct at the home he shares with his girlfriend in Middletown, Conn. His girlfriend was also charged. It will be interesting to see how the team handles this situation. Spievey and his girlfriend have hearings scheduled on April 11. Off-season workouts begin April 15. Not so sure domestic issues can be weighed the same as drunk driving or marijuana possession. Although all display incredibly poor judgment. Spievey, who missed 11 games of the 2012 season with a concussion, agreed to a one-year contract $630,000 with the Detroit Lions two weeks ago. He’s expected to compete for a backup role for 2013. Free safety Louis Delmas will return after signing a two-year deal. Also the Lions signed free agent safety Glover Quin, formerly of the Houston Texans. It’s been a quiet offseason for the Detroit Lions on the legal front. Safety Amari Spievey, who just signed a one-year contract, was arrested in Middletown, Conn., after a fight with his girlfriend over child support. Last spring Nick Fairley and Mikel Leshoure embarrassed the team with their arrests. Aaron Berry was released after his second arrest last summer. That move sent quite a message. Spievey missed most of the 2012 season with a concussion. He has been cleared for contact. His role for the 2013 season has yet to be defined. Free safety Louis Delmas will return after signing a two-year deal. Also the Lions signed free agent safety Glover Quin, formerly of the Houston Texans. He has been with the Lions for three seasons after he was drafted in the third round in 2010 out of Iowa where he played cornerback. He was converted to safety in training camp of his rookie season. He has started in 26 games, including two in 2012 before he suffered a concussion in the Monday night game at Chicago on Oct. 22. It was his last game of the season. Spievey was coming off a stellar 2011 season in which he started 15 games and had three interceptions. Had a blast today on the live chat. You can see full transcript here. I don't think I answered as many questions on Darrius Heyward-Bey as last week, but there were several. We also discussed priorities for draft (OL or DE? ), free agency and much more. Will have another live chat at 3 p.m. on Thursday, April 4. With the absence of Titus Young, the Detroit Lions are in need of another wide receiver to place across from Calvin Johnson. Nate Burleson will return, but he’ll be 32 in August and is coming off a broken leg. Ryan Broyles, who is coming off ACL surgery, might not be ready to start the season. Is free agent Darrius Heyward-Bey the answer? Bey is expected to visit the Lions after stopping in to visit the Indianapolis Colts on Monday. He was drafted seventh overall in 2009 by the Raiders. It was considered a reach, but his strength was his straight-line speed. Heyward-Bey started 14 games last season, finishing with 41 catches for 606 yards and five touchdowns. 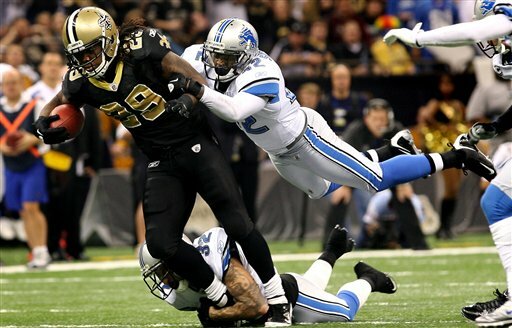 Certainly the Lions will closely look at Heyward-Bey’s concussion history. He was knocked unconscious in Week 3 last season. He said it took a week to feel like himself again. He missed the game the next week, then had a bye week before getting back in action. His best season was in 2011 when he had 64 catches for 975 yards and four touchdowns. Outside linebacker Justin Durant has agreed to a two-year deal with the Dallas Cowboys which will be finalized when they clear enough cap space. Durant spent the last two seasons with the Detroit Lions as a starter alongside Stephen Tulloch and DeAndre Levy. It’s not a huge surprise that he wasn’t re-signed by the Lions. It was expected that either he or Levy would return. Levy signed a new three-year deal on March 6. Durant is a big loss. He played in 14 games last season and had 103 tackles, half a sack and three pass defenses. He played in a dozen games in 2011. Prior to joining the Lions he played four seasons in Jacksonville. The Lions could draft to fill the position. Jarvis Jones out of Georgia would fit the bill in the first round. Also the Lions expect Ashlee Palmer to compete for the starting job, along with young guys like Tahir Whitehead and Travis Lewis who were rookies last season. Running back Onterio McCalebb visited the Lions on Monday as one of their 30 pre-draft visits. McCalebb (Auburn) is undersized at 5-foot-10 and 168 pounds, but it’s his speed and versatility that could make him a late, late round pick. He may not be durable enough as a running back, but it’s his kick return ability that could interest teams. He ran the 40-yard dash in 4.34 at the Combine and ran an unofficial 4.29 at Auburn’s Pro Day on March 5. He also was measured with a 37-inch vertical leap at his Pro Day, three inches higher than at the Combine. "When I was up there at the Combine, all the coaches asked what are your weaknesses and your strengths. I told them my strength is running and my weakness is catching the ball and blocking. But, you can always get better at everything you do,’’ McCalebb said on his Pro Day according to Dayne Young of WRBL TV 3 News. He sees himself as a player who returns kicks and can be used as a third-down back and receiver on the edge. Some teams asked him to go through defensive back drills at his Pro Day even though he hasn’t played cornerback since high school. The Lions seem set at running back with the addition of Reggie Bush. Mikel Leshoure and Joique Bell carried the load last season. McCalebb is projected as a seventh-round pick or free agent. The Lions have the fifth overall pick in the draft and eight total picks, including a pair in the seventh round. 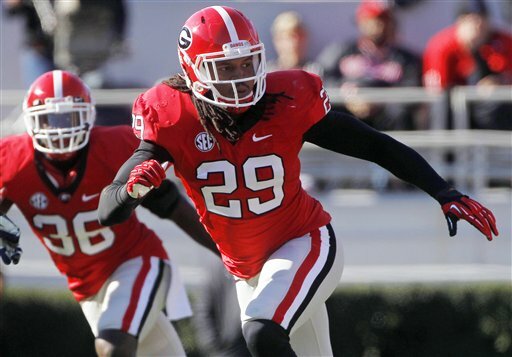 Detroit Lions draft: Is Desmond Trufant an under-rated corner? The NFL draft is creeping right up, only a month away. The speculation, which for some fans started in October, continues to grow. Here’s a question: Up until now has cornerback Desmond Trufant been under-rated? In ProFootballTalk.com’s first mock draft, which was posted (without apology) on Sunday night, they have the Detroit Lions drafting Trufant with the fifth overall pick. They have Alabama’s Dee Milliner — who most consider the top cornerback in the draft — going ninth. Trufant, who is 6-foot and 190 pounds, ran a blazing fast speed of 4.38 at the NFL Combine. Perhaps more importantly, he was a standout in the Senior Bowl for the losing North squad. 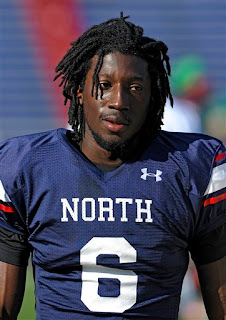 Lions coach Jim Schwartz was the coach for the south teams so obviously he had a good look at Trufant that week. 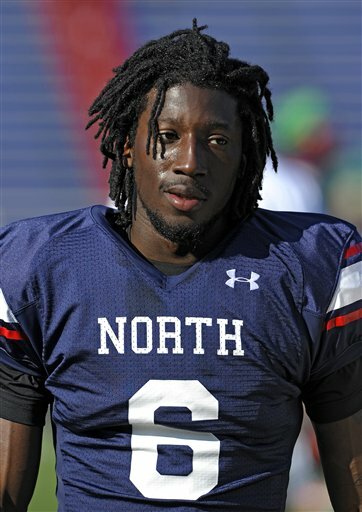 Trufant continued to impress at Washington’s Pro Day on March 13. According to NFL.com, representatives from the Seahawks, Jaguars and Colts were on hand that day. If bloodlines matter, Desmond’s brother Marcus was the first-round pick of the Seahawks in 2003 and also ran a 4.38 at the Combine. Not every draft expert rates Trufant so high. Scouts Inc., has him as the second-best cornerback behind Milliner and the 22nd best player on the draft board. ESPN’s Mel Kiper ranks Trufant as the second corner and has him drafted 28th by the Broncos, while he has Milliner going fourth to the Eagles and defensive end Ziggy Ansah going to the Lions with the fifth pick. CBSSports.com has Trufant ranked 21st on the big board. Perhaps, ProFootballTalk.com described the draft as a crapshoot. That’s the perfect word for it. No one knows. Maybe the PFT knows something about Trufant that others don’t. Maybe general manager Martin Mayhew and the Lions love Trufant and maybe they don’t. We’ll know on April 25. Wright played one season for the Lions before signing a $37.5 million five-year deal with Tampa Bay a year ago. His contract runs through 2016 and pays him a base of $7.75 million in 2013. It’s not guaranteed however because of his four-game suspension last season for using performance-enhancing drugs. Lions defensive coordinator Gunther Cunningham liked Wright’s play with the Lions, but after the suspension just can’t see the Lions going after him again. If the Bucs don’t find a suitor, they could cut him and then Wright would have to find the best deal on the open market. 2. Jarvis Jones, the outside linebacker from Georgia, is set to visit the Lions who have the No. 5 pick in the draft. Jones’ time in the 40 was 4.9 seconds at the Georgia Pro Day this week. It’s slower than expected. Some draftniks expect Jones will slide down the draft board a bit. However, Jones was productive at Georgia in the always tough SEC, so maybe that time won’t mean all that much. Jones, a pass-rushing specialist, could be moved to defensive end in the NFL which is a definite need for the Lions. 3. 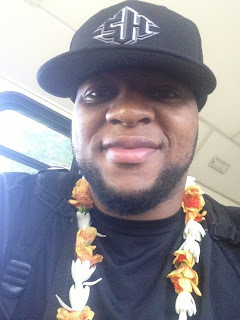 If you didn’t catch my blog about Ndamukong Suh’s unexpected meeting with a bloody, drunk, wet fan in Vegas, check it out. Also according to the witness (@JoeFortenbaugh), Suh couldn’t have been nicer in the strange situation. Good to hear. Just had to share this tale from Las Vegas Twitter episode with Detroit Lions fans. The story in seven parts was tweeted out by Joe Fortenbaugh (@JoeFortenbaugh) who is a writer for the National Football Post. He sent it out Thursday night from Las Vegas. ...the shallow Venetian "canals" this afternoon. Busted his head open (not too serious) & struggled mightily (to our amusement) to get out..
... Lions DT Ndamukong Suh. ... Suh spent 5 minutes chatting and posing (all the while smirking) for pictures with this bleeding, soaking wet mess of a bro. For the life of me I don’t understand sports fans and their total fascination with big name players and coaches. Especially those on the back end of their careers. 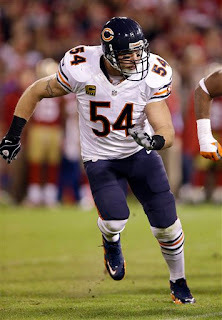 Please, please stop the chatter about getting middle linebacker Brian Urlacher to the Detroit Lions. What is it about big-name players and coaches that makes intelligent fans totally unreasonable? Heard this has been a topic this week on Detroit sports talk radio. Why? The Lions spent big money on a certain middle linebackers named Stephen Tulloch a year ago. Their roster still has a few holes, but middle linebacker is not a concern. Tulloch does his job extremely well. He’s a play maker, a leader and his career path still trends up. Apparently certain sports talk hosts thought Urlacher to Detroit would be a great idea because he could show those Chicago Bears a thing or two. The Bears, under their new coaching staff, have insulted Urlacher with a $2 million offer. Urlacher isn’t out for revenge, he wants to land with a good team. “I’m an old fart, so I want to go in there and win,” he told The Dan Patrick Show on Friday morning. A few teams including the Vikings, Cowboys and Cardinals have shown interest in the 34-year-old middle linebacker who turns 35 in May. His production has declined the last three seasons. He’s not the same powerful inside force as he once was. The Lions absolutely do not need a middle linebacker and it’s amazing to me that fans hear a big name and get enamored without clearly thinking through the process. During my weekly live chat on Thursday several questions popped up asking if the Lions were interested in free agent wide receiver Darrius Heyward-Bey. A big name? Yes. Same guy who was knocked out of the 2012 season in September after a bone-jarring hit rendered him unconscious for 10 minutes. It was a serious concussion. How can anyone think the Lions would risk signing a player with a serious concussion history after what they have gone through with Jahvid Best? Just because a player has a recognizable name does not mean he’s the answer for every team. She understands that, but so many don’t. This happens all the time with players, coaches and general managers. Remember when the Lions hired Matt Millen as general manager? Fans loved the hire at first because they knew MiIlen as the former NFL linebacker with four Super Bowl rings, but mostly they knew him from his NFL television work. He was cool, everyone knew him. His lack of NFL executive credentials were overlooked because he was the big name guy. Of the three free agents the Lions signed from other teams, Reggie Bush is the most recognizable name. The veteran running back may add a new dimension to the Lions’ pass-happy offense. That’s what the Lions are counting on . However, the wisest move may have been to sign safety Glover Quin from the Houston Texans. He is not a household name, but he’s likely the Lions’ best signing so far. That’s how Lions’ fans need to think. Look at the big picture, not the big names. Jarvis Jones, the outside linebacker, worked out at Georgia’s Pro Day on Thursday (today) and declared himself the No. 1 player in the draft. We’ll see about that. ESPN’s Mel Kiper has him ranked fifth on his big board while Todd McShay from Scouts Inc. ranks him at 14th. Jones did say on Thursday that the Detroit Lions are one of three teams that has a visit scheduled with him. The Lions own the fifth overall pick. The other teams he will visit are Kansas City (No. 1 pick) and the Philadelphia Eagles (No. 4 pick). Jones did not work out at the Combine instead waiting for Pro Day. He has been cleared by an orthopedic doctor after being diagnosed with spinal stenosis when he was a freshman at USC. The Trojans wouldn’t let him continue to play so he transferred to Georgia where he played three seasons without incident. Jones has the possibility to fill a pass-rushing role similar to that of Denver’s Von Miller who has 30 sacks in his first two NFL seasons. The Lions have not re-signed Justin Durant leaving a hole at outside linebacker. There’s a chance they could move Jones to defensive end which is also a position of need with Cliff Avril and Kyle Vanden Bosch gone. Kiper and McShay have the Lions drafting defensive end Ezekiel “Ziggy” Ansah from BYU with the fifth pick. Ansah lacks experience but was dominant in the Senior Bowl. Drafting an offensive tackle is a possibility, but the Lions have more needs on defense. For 21 seasons, Jason Hanson has been the mainstay of the Detroit Lions. Wearing No. 4, the kicker has been steady throughout the good seasons and the stinkers. After months of debating, Hanson told the Lions last week that he wanted to return for his 22nd season. Now all that stands in the way is a contract. The Lions have made an offer, but it appears getting Hanson back will not be automatic. A contract may be tougher to negotiate than previously thought. He could draw interest from other teams. Hanson told reporters in December that if he did return for the 2013 season he’d only do so if he could play for the Lions. Hanson made $2.55 million last season, but is unlikely to get that much for 2013. Perhaps his tune has changed since the end of the 4-12 season. He’s had time to think without the immediate, raw disappointment of the end of the season interfering. It’s another reason he waited to make a decision on whether to return. He wanted to clear his head, take the emotion out of the equation. Hanson also said back then that he didn’t see the Lions in full rebuilding mode which might affect his decision. Instead, he said the team under-performed. No one can quibble with that. Hanson also doesn’t want to be a player who fades away. He showed no signs of faltering last season when he connected on 32 of 36 field goal attempts for 88.9 percent rate which is higher than his career percentage of 82.4. A 44-yard field goal in the season’s final game was his 188th at 40-plus yards which set an NFL record for most 40-plus field goals in NFL history. He also holds the record for most 50-plus yard field goals at 52. His 134 points in 2012 set a new franchise record, breaking his own record of 132 points scored in 1995. Prior to the 2010 season, when the roster was overhauled big-time, some of the newer guys thought the slight bald guy in the locker room was another coach. Instead it was Hanson who at age 42 is still kicking. Now we’re just not so sure it will be with the Lions.